Longleaf pine once occupied over 90 million acres throughout the Southeastern United States. Imagine tall, majestic stands of trees as far as you can see, dominated by one species, the beautiful longleaf, with a diverse array of grasses occupying the sunny spots between trees. It must have been quite a sight. Unfortunately, due to the disruption of natural fire regimes and factors such as urbanization, agricultural land conversation and commercial harvesting of longleaf, currently less than 2 million acres of longleaf pine remain today. That is a 97 percent loss of this ecosystem, and much of what remains is severely fragmented. Remaining healthy stands of longleaf pine are areas rich with biodiversity. The loss of these longleaf communities affects numerous other species, including Gopher Tortoises (Gopherus polyphemus) and Eastern Indigo Snakes (Drymarchon couperi), our flagship species. One of the primary objectives of The Orianne Indigo Snake Land Management Program is to restore and help manage Eastern Indigo Snake habitat throughout the region they historically and currently occupy. Eastern Indigo Snakes are closely associated with longleaf pine sandhills, particularly at the northern parts of their range. The primary mechanism for this association appears to be the Indigo Snake’s dependency on Gopher Tortoise burrows for winter refugia. Although Indigo Snakes appear to use a variety of natural habitats for foraging during the warm spring-autumn months, winter habitat and shelter use are almost exclusively associated with Gopher Tortoise burrows on xeric sandhills. These burrows provide a thermally stable environment during the winter and are the warmest and most stable microhabitats available to Indigo Snakes during cold weather. For example, between Dec. 17, 2010 and Jan. 16, 2011, the mean temperature at the back of a three-meter-long Gopher Tortoise burrow in south Georgia was 16.9°C (62.42°F) with an absolute minimum and maximum temperature of 15.6°C (60.08°F) and 18.4°C (65.12°F) respectively. Temperatures deeper within burrows would display less variance, likely staying relatively warmer in the winter and cooler in the summer. In contrast, the mean surface temperature, as experienced by an adult Eastern Indigo Snake, during this same time period was 10.6°C (51.08°F) with minimum and maximum temperatures of -4.2°C (24.44°F) and 40.8°C (105.44°F) respectively. Based on this close association, Gopher Tortoise burrows are likely a limiting resource for Eastern Indigo Snakes in the northern part of their range. 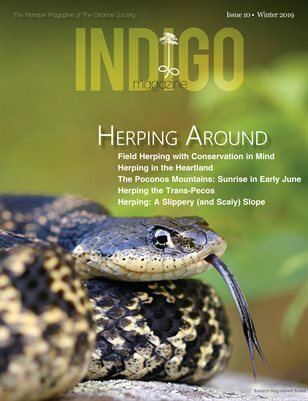 Indigo Snake declines are attributed, in part, to habitat loss and fragmentation; however, habitat alteration through fire suppression and commercial forestry has likely contributed strongly to Indigo Snake declines by eliminating suitable habitat for Gopher Tortoises. Gopher Tortoises require the open canopy and herbaceous ground cover of the historically fire-maintained longleaf pine ecosystem and research concludes that the loss of these habitat features has contributed to Gopher Tortoise declines throughout the southeast. So, although forested vegetation communities still occur throughout the Altamaha River Basin of southern Georgia, the lack of suitable Gopher Tortoise habitat renders much of this area unsuitable for Indigo Snakes. Reestablishing Indigo Snakes in these areas, a goal of The Orianne Society, will first require reestablishing the habitat conditions. In 2012, The Orianne Society was awarded a grant from the National Fish and Wildlife Foundation (NFWF) via the Southern Company Longleaf Legacy Program to plant and restore longleaf pine communities in the Altamaha River Corridor in the state of Georgia. The Altamaha River Corridor consists of 11 Georgia counties and was designated by The Nature Conservancy as one of the 75 “Last Great Places in the World”. Longleaf pine is native to this region and there are numerous federal, state, regional and local initiatives to conserve the natural resources in this area, including our own efforts on the Orianne Indigo Snake Preserve (OISP). The project funded by the award includes the implementation of prescribed fire on over 6,500 acres of privately owned lands and the OISP, hand planting of 312,000 longleaf pine seedlings on the OISP, the collection of native groundcover seed to be sown at longleaf restoration sites, and an outreach effort for private landowners about the benefits of the longleaf pine ecosystem and the programs available to them to create, restore, and enhance longleaf pine natural communities.